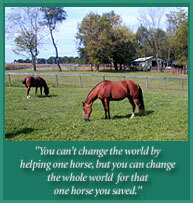 Jules was a racing thoroughbred from Kentucky who could no longer run. Due to lameness issues, Jules was on his way to auction when intercepted by Mylestone. However, his stay with us wasn't that long, and Myles returned to his state of birth, Kentucky. He has been adopted and lives with a wonderful family with other rescue horses. Thanks to Re-Run and the Exceller Fund for helping Myles find a brand new life.